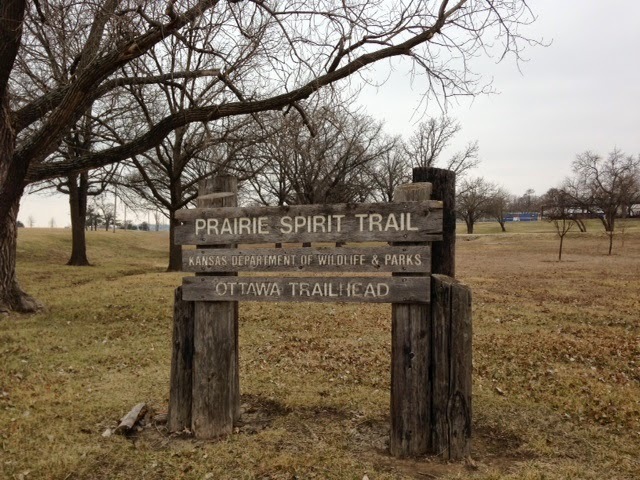 The Prairie Spirit Trail 100 was my fourth attempt at the distance. 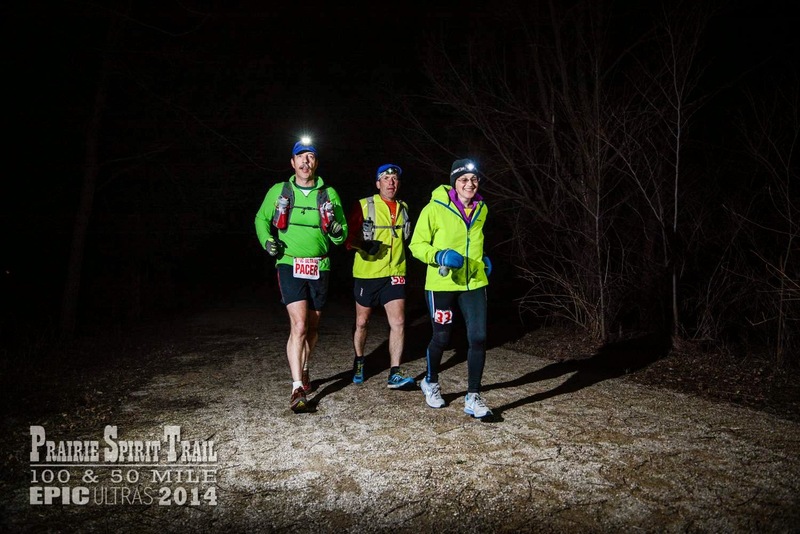 I'd only finished one other time and chose this event to celebrate my 50th birthday (March 28) and test what I'd learned from the Did Not FInish experiences (DNFs). Apparently, I learned a lot along the way. 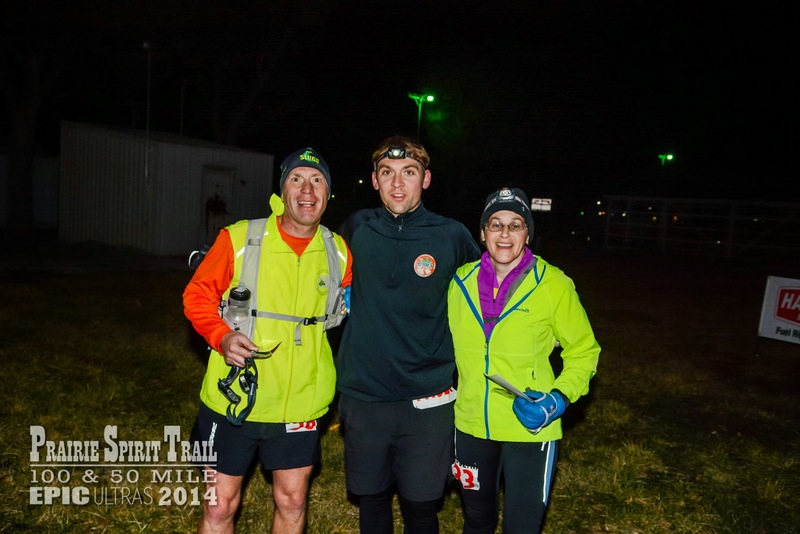 Below is a list of what I did right this time to capture a second 100 mile finish. I took care of my feet early. I started feeling some toe discomfort at mile 25 or so. Instead of waiting until the next aid station, I pulled over at an unmanned water stop and unpacked my foot care ziploc bag. I decided, for the first time, to carry it with me. A band-aid provided comfort and held until the end of the race. I ended up with a somewhat larger blister at the finish, but nothing that prevented my running for the next 75 miles. Ottawa Trailhead on Friday morning. There were no questionable shoes. Instead of “trying” some shoes I didn’t have full confidence in, I stuck to old faithful shoes, the ones I train in day in and day out. I used two pairs of identical Brooks Glycerins (miles 0-40 and 77-100) and one pair of Nike Pegasus (40-77). I’m looking forward to trying the new extra cushy Brooks Transcend (the Hoka of Brooks). On my own in the cool of the morning. I slowed down early. I knew from the outset I was going too fast, but it wasn’t until about mile 35 I eased into a run/walk strategy. Most of the runners near me were doing some kind of run x/walk x minutes. Some did 9/1, some did 3/2 and one group at the end was doing 90 sec/90 sec. I don’t like the watch method and sadly the course is dead flat, so “walking the hills” is not an option. The course does have mileposts, wooden markers on the right outbound and left inbound. My strategy was to run to the next marker and when I found it, walk for one minute. It kept me attentive and slowed my pace nicely. I also got “used to” the start/stop that would inevitably be required later in the race. With Carl just before Garnett. I ate only one gel for 100 miles. I use gels mostly as back up when either the food offered is not enticing or when I’m between aid stations and need some calories. This time I was able to eat a few hundred calories at each aid station. I had the gel at an early aid station that didn’t have a hot non-meat “real food” offering. The gel worked fine (Hammer raspberry). I carried two gels in my pack for 100 miles. They came home with me (Hammer Espresso from our 24 hour race and Hammer apple from this race). 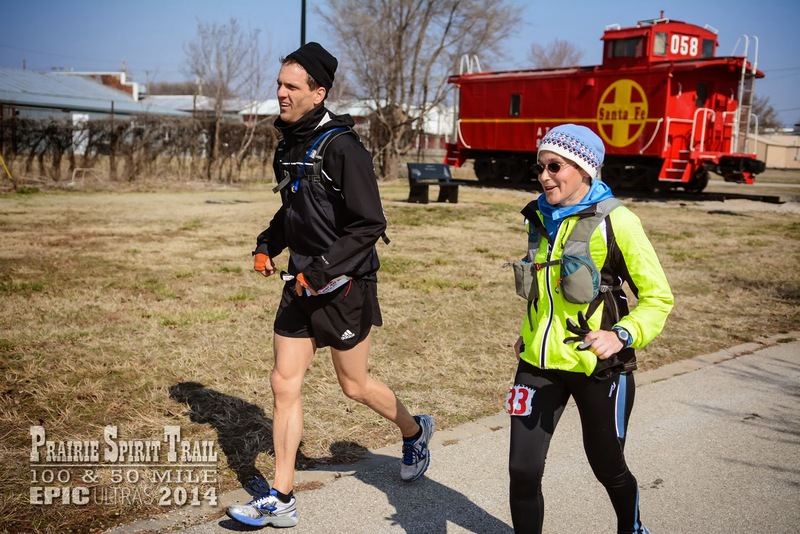 On the trail about mile 62 with pacer David. SRRs will meet him - he's coming to Cambridge this summer. I did not carry a water bottle until mile 30. One of my downfalls in earlier 100s was drinking too much. Since Prairie Spirit has water no further away than six miles, I chose to carry a collapsable cup in the early cool hours. I put my handheld 10 ounce bottle in my 30 mile drop bag. I picked it up then because the sun was getting stronger and we expected 65 degrees or so in the afternoon. I didn’t worry over water. I did what Tim Noakes told us to do: I drank when I was thirsty. By the end of the night my throat was sore (that happens to me at all 100s) so I drank the cool water just to soothe it. I think I got a good deal of my hydration by eating oranges and bananas and a cup of Heed at pretty much every aid station. Finishing with Jim at my side. I found a friend. About mile forty I was feeling beat up physically and getting mentally weak. A few chats with folks didn’t lead to any connections. Then I caught up to Jim. He was quick to say he was having a rough time and we quickly got on to other matters: what other ultras we’d done, our running clubs, family, interests... The next thing we knew we were at the 50 mile mark, the turnaround point. He went off with his crew (“it’s like a spa”) and I visited the aid station. I then found him and the crew and asked if I could “tag along” on the way back. They all said “yes” and Jim and I headed out with one of his several pacers. At the finish with pacer Travis. I erred on the side of being too warm. 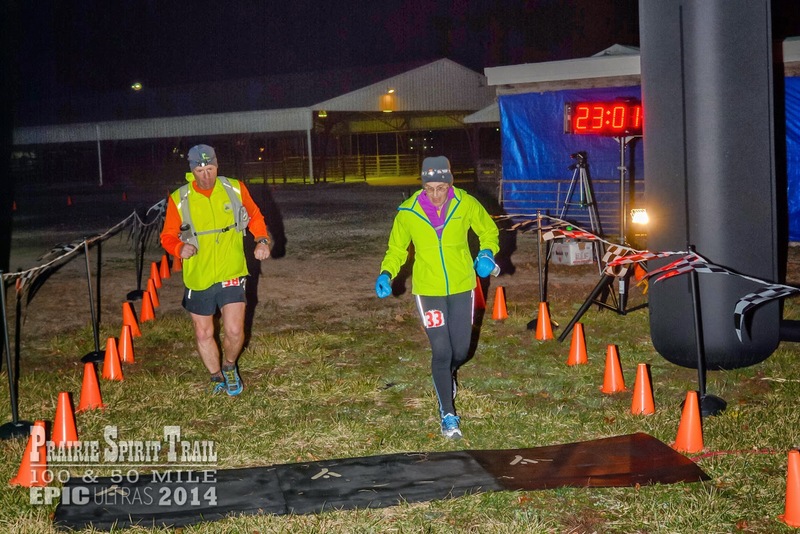 I’ve done near hypothermia before and as someone who is generally cold, I know it can take me out of a long race. Thus, I dressed for slightly cooler conditions than the weather predicted. I used giant winter mittens (Knutes - I love them!!) at the start and had my favorite zipup hood jacket for the evening. I wore the latter around my waist for some miles but was glad to have it when the wind kicked up in some pockets. I didn’t bother putting on shorts during the heat of the day and wore the same black tights for 100 miles. My legs don’t seen to mind being warm. 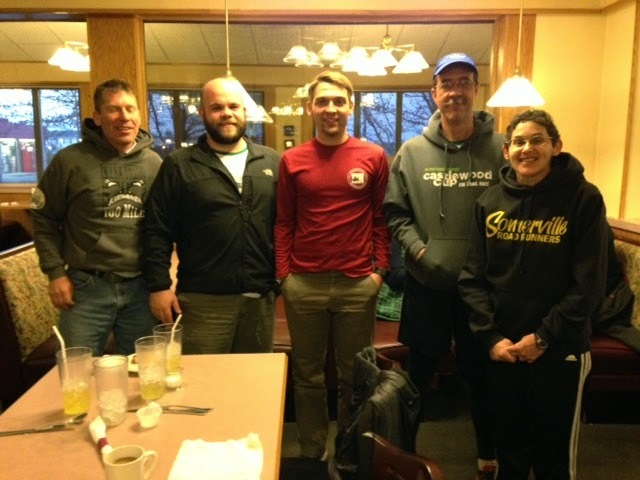 Jim, Justin, Travis, David and me after our celebratory breakfast with David Horton (who had to to get back to the finish). They are all "SLUGS" - St. Louis Ultra Group. We stuck to the plan. Jim quickly bought on to my “walk a minute at each milepost” plan and we implemented that with our two pacers. The pacer, with fresh eyes in the dark, was in charge of finding the posts and I was in charge of timing the minute of walking. It got harder as the night went on: I could not remember for a minute at what number of seconds on my watch we’d started walking! We probably went over a minute of walking a few times....ooops. Still, we ran that way the whole night - except the end. More on that below. My second buckle for my second 100 finish. First one was NJ Ultrafest March 2013. We had a “sprint.” As we got nearer the finish it became clear we’d easily hit Jim’s (and my secret) goal of a sub 24 hour time, but we were really close to sub 23. Pacer Travis asked if we wanted to go for it. I noted some knee pain and voted “no” and urged Jim and Travis to go ahead. They would not. Jim suggested we turn off the walk/run for the last 2.5 miles. 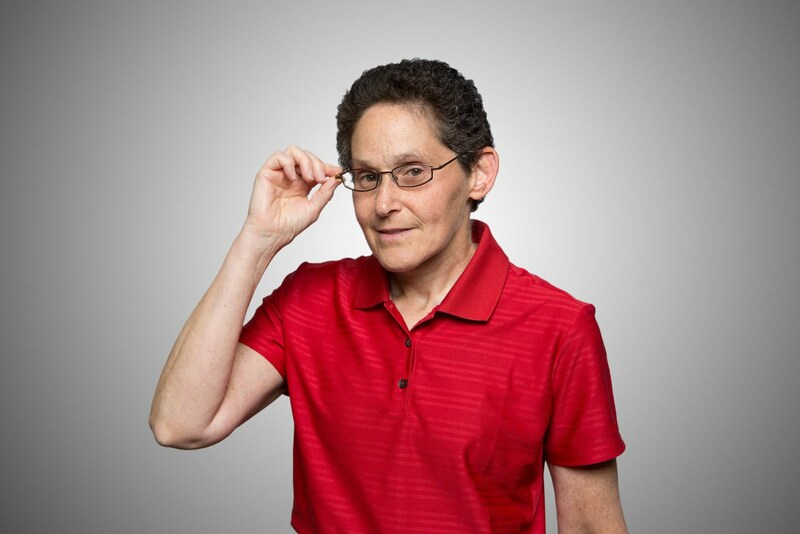 I was hesitant, but decided to try; if I had to walk, I would. 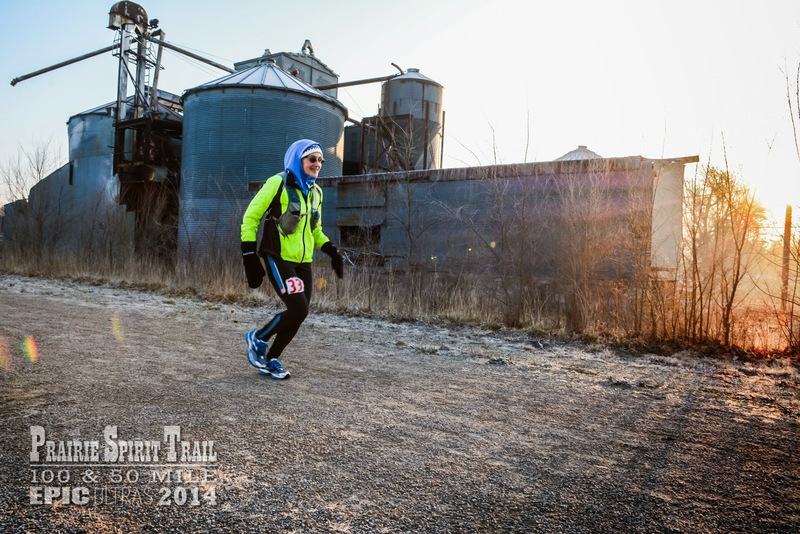 We dug in, blinking in the night to find the glowing finish line among the industrial buildings at the edge of town. Jim said we got down to a 10 minute mile. I can’t say for sure, but it sure felt like we were booking! Great report Adena, Great Run. You made it so enjoyable for me and I think also Travis, David and Justin. Thank you. Thank you. Thank you. Showing last 2.32 miles as 11:33 11:00 11:03. It felt like 10 or better.